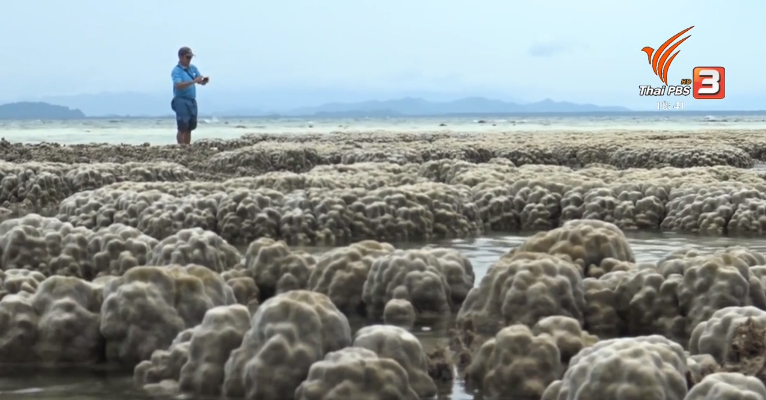 The extreme low tide in the Gulf off Prachuab Khiri Khan coast exposing coral reefs during June 16-17 is a normal natural phenomenon which happens during the monsoon season and has nothing to do with tsunami, said marine and environmental expert Thorn Thamrongnawasawat on Monday. The unusual low tide in the sea of Ao Muk, Ao Yai, Ao Thien and Ko Thalu in Tambon Saithong, Bang Sapannoi district was the lowest in 20 years – to the extent that many coral reefs, giant clams and sea urchins were exposed for a distance of about two kilometres long. Assistant Professor Thorn attributed the phenomenon which he described as normal to the low tide of the month, between June 16-17 from noon to 4 pm, compounded by strong winds from the Andaman Sea which blew toward the Gulf, pushing water away from the shoreline, resulting in extreme low tide. Meanwhile, Mr Pipat Charoenpak, secretary of the Foundation for the Rehabilitation of Siam Sea Resources, said that he surveyed the sea off Bang Sapannoi district on Monday and found the sea level has returned to normal with all the coral reefs submerged and not visible.